On 31 May, CosmoCaixa Barcelona hosted a new edition of the UOC Research Showcase. The event aimed to foster collaboration among the University’s R&I professionals by improving the visibility of the research and projects that they are currently engaged in. For this event, the UOC’s Scientific and Research Committee selected 21 research and innovation projects that were presented during the event. 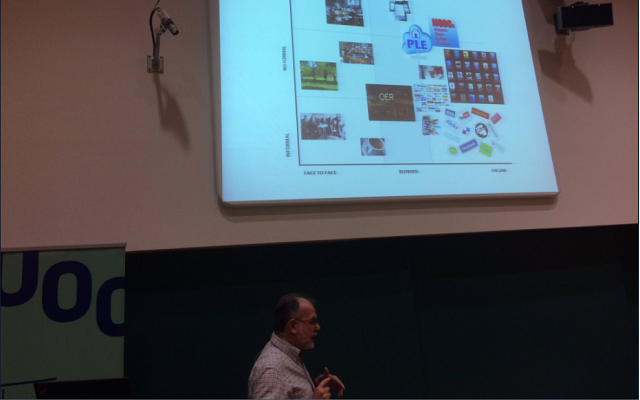 In this sense, the researcher of Edul@b Albert Sangrà made a presentation on one of the main lines of research of the Edul@b group: the study of learning ecologies. People learn in many ways, mixing formal, non-formal and informal activities, in face-to-face, blended or online environments. All of them are part of an individual’s ecology of learning, which is the set of activities, resources, relationships and interactions, physical or virtual, that provide opportunities for learning. How people do that? Which patterns could we identify? Do different collectives react with different patterns when organizing their ecologies? How does technology expand and enlarge these resources to become opportunities? This line of research tries to provide some answers to these questions.